It may seem enough to lay under the Mediterranean sun and dive in the cool blue of the Aegean, but this can hardly be described as vacation in Naxos. The largest of the Cyclades islands, has a long history to explore, many beautiful beaches to sunbath on, numerous churches to pray at, dozens of villages to visit and limitless possibilities to take upon. Although it’s impossible to fit all these in a week’s scheduling, reading our article will help you get the best experience. We understand that you’re super excited to be at Naxos and all you think of are the beaches, so pun on your sunblock and your sandals, cause there’s where you should be heading. Just a short walk from the hotel, Aghios Georgios is the town’s beach that locals choose when they don’t feel like travelling half the island -or even a couple of kilometers away. There you’ll find hundreds of parasols and beach chaise lounges to relax, next to clear waters. If you ever feel a bit hungry there are many cantines you’ll be able to nibble on something. Work on your tan and when you feel it’s too hot for you, simply dive in to regain your cool! On the afternoon, head over the Chora of Naxos and walk around it, from Mpourgos to the Castle, visit the archaeological site of Grotta and spend the last minutes of sunlight either on the Port watching the Portaria ruins or on it, gasping to the beauty of the sunset. Since it’s dinner time, try local dishes at the taverns by the town’s main square. Again, we know that all you want is sea and sun, so you should visit Aghios Prokopios beach, probably the best and most awarded beach of the Cyclades. There you’ll be amazed by the golden sandy beach and crystal clear blue-azure waters. The beach is generally well organized, but there are places you can lie down by yourself, or with your company, away from the hoi polloi. Afterwards head towards Iria and the sanctuary of Dionysus. This temple is now restored, since the original was converted into a church in the 5th or 6th century AD, but floods from the nearby river lead to its abandonment. Take a snack and a bottle of water and head to temple of Dimitra, even more south. The monumental temple, built exclusively out of Naxian marble, was constructed in the late 6th century BC and was dedicated to Demeter, Apollo and Kore, emphasizing of their earthly characteristics. During the paleo-Christian period this temple was also turned into a Basilica church. For dinner or a late afternoon swim, head to Kastraki and its nearby Aliki, Pirgaki or MIkri Vigla beaches. Having already worked on your tan a bit, today it’s stay in, tan more and visit the town day. Relax by the pool with your favourite book or browse through the latest magazines or better, borrow a book about Naxos’ mythology and history from our . The pool bar is there for a snack, a beer or a refreshing cocktail. Keep the relaxed mood and do a museum and sights walk in town. Wear your bikini and sunblock to keep the tanning, but bring a t-shirt with you for the churches visits. Stop by the shops, try an ice-cream and explore everything there is to explore in the old and new town. Walk back to the hotel for a quick dive in the pool, a shower and a late dinner at Thyme and Olive. Well rested and refreshed today is the day to embark on a quest to explore the natural beauty of Naxos. Start your journey going North, to Apollonas, passing through the Ipsiloteras Tower and the dam. At Apollonia take a quick, refreshing dive and head to see the Kouros. Continue by driving up the Zas Mountain and behold the amazing views. Stop at Apiranthos for local products and a snack if you’re feeling hungry already. Visit the Za cave (or Aria) where Mythology has is the All-Mighty Zeus was raised. There is a close by sanctuary on the mountain with two identical inscriptions, dating back to the 4th century BC, writing “ΟΡΟΣ ΔΙΟΣ ΜΗΛΩΣΙΟΥ” (“Mount of Zeus, Protector of Sheep”). Continue traveling South, and visit the Towers of Driovela and Himaros, keep South and you’ll come upon Fiontas Archaeological sight. 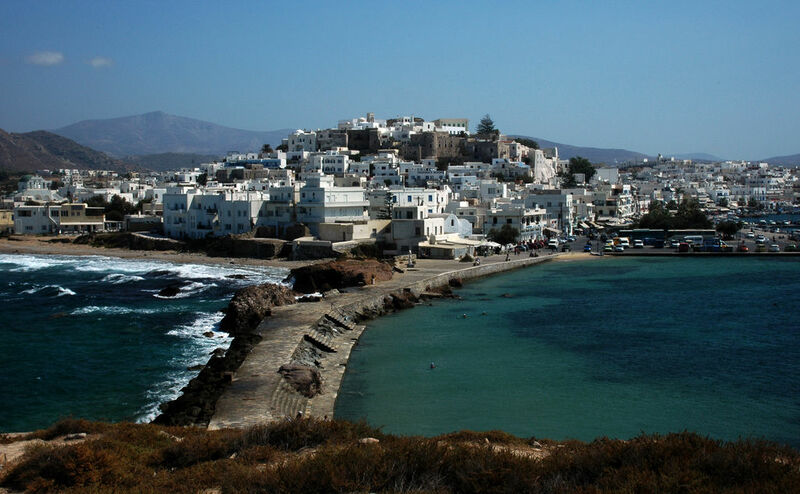 From there, you’ll either keep going South to Kalados bay and Askitis cave or take the Filoti road to Naxos. Filoti is a great place to stop for dinner, or continue towards the Chora, by passing through the second famous kouros. Take the ferry to Schinousa, an island so small you can walk from head to toe in a few hours! It’s really secular and you’ll find unique beaches and places to explore. The island has just two taverns, so you better call and make a reservation for lunch. Return to Naxos by the afternoon ferry and head to any beach. Watch as the sun set in the sea and take another stroll down the town for dinner and then go out for raki! Next morning you’ll feel like you’ve experienced all of Naxos in a week!